I first coated the entire model, a revell aztec slinger with greenstuff and pressed marks in with my fingers. I then build up mounds for the ears. The rest is pretty simple. 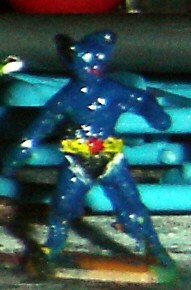 Basecoat of blue, black shorts, yellow belt, white eyes and teeth, and a big red mouth. A simple conversion for a nice result.